This small creek that skirts the town of Mammoth Lakes, provides convenient fishing as well as a pleasant multi-use path. Mammoth Creek flows from Mammoth Lakes basin, skirts town, and continues on to Hot Creek. Find convenient fishing just south of town at Sherwin Meadows. Stroll or bike along the multi-use path. Running down from Mammoth Lakes basin and continuing through the town of Mammoth Lakes and down to Hot Creek, Mammoth Creek is a great place for quick fishing foray, or pleasant afternoon stroll. Your best bet for access is along the Sherwin Meadows Area, just south of Mammoth Lakes off US 395. Only have an hour to fish? 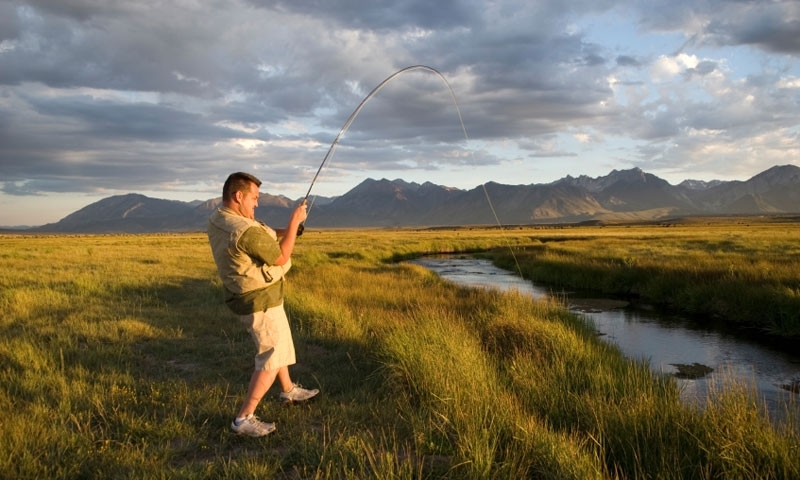 Mammoth Creek is close, convenient, and tts waters are regularly stocked with rainbow trout. Much of the creek runs through private property, so fishing just south of town, near Sherwin Meadows just off US 395, is your best bet. Pick up this casual trail across the street from the Stove Restaurant, next to the bridge crossing the creek. The path meanders downhill for about a mile to a picnic area. Visitors will be treated to great scenery. This path is a perfect for parents with young children or for a casual afternoon stroll.